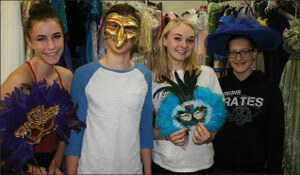 ONE performers Kayelin Leonhirth, Mitchell Greene, Ginny Swanson, and stage manager Erin Phares have fun in the costume room at Shorecrest during a Phantom rehearsal. Does The Old Northeast neighborhood attract artistic types, or does living here inspire our residents to develop their creative side? We have writers, painters, sculptors and other fine artists, photographers, performance artists, musicians, dancers and singers. Why, there’s even a hat maker and a fashion designer. Our city is, after all, ranked the #1 arts destination for mid-sized cities (AmericanStyle Magazine) and one of America’s top arts places (ArtPlace America). National publications, including the New York Times, Forbes and National Geographic, rave about our arts and entertainment scene. It should come as no surprise, then, that our creative corner of town is producing exceptionally talented kids who’ve grown up within walking distance of art museums, galleries, and live performance venues. The ’hood is located so close to Vinoy and Straub parks – with concerts and festivals year-round – that our youngsters think hearing live music without leaving home is normal. Children who are inspired to love theater and the arts at a young age are more likely to develop creative gifts and maintain a lifelong appreciation for the performing arts, find researchers. In fact, a study conducted by the University of California Los Angeles found that students involved in the arts have better academic performance, are more involved in community service, and are less likely to drop out of school. As the parent of a musical theatre student, I can personally attest to that. Our daughter, Ginny, has grown up in the ONE surrounded by creative friends, classmates, and neighbors. Our 1920’s bungalow had a sunken room that made the perfect sitting area for an audience. With our dining room chairs lined up theatre-style, we’ve watched countless live dramas, ballets, musicals, and vocal concerts performed by Ginny and friends. Ginny’s classmate, Kayelin Leonhirth of Granada Terrace, has been dancing for many years and has performed at major venues, including the Straz Center in Tampa and both the Mahaffey and Palladium Theaters in St. Petersburg. A sophomore, she grew up watching Shorecrest’s plays and musicals – and was determined to be on stage at the school’s 650-seat Janet Root Theatre. “I’ve always seen the musicals at my school and been inspired by the talent. I’ve always wanted to be just like them, and now I’m doing what those students were doing. I love singing and dancing. They are my passions,” she says. In April, Kayelin, who dances on pointe – a major goal in a ballerina’s dance life – will perform as the lead ballerina Meg in Shorecrest Theatre’s Phantom of the Opera. The Shorecrest Theatre program is considered one of the best in the Tampa Bay area. Last year, its musical production Anything Goes was ranked one of the state’s best high school productions, and the students received a standing ovation when they performed the show for an audience of 2,500 at the Straz Center’s Morsani Hall. “It was absolutely amazing to perform on that stage in front of a full house,” recalls Ginny, who played Hope Harcourt in the Cole Porter golden-age musical. This year, she’s playing one of her dream roles as Christine in Shorecrest’s Phantom. Music director Michael McCarthy leads the cast. An internationally acclaimed actor and singer, McCarthy starred as the Phantom in Ken Hill’s original musical adaptation of the novel Phantom of the Opera in London’s West End and UK tour. Among his Broadway and international credits are lead roles in Les Mis and Sweeney Todd. Erin Phares, whose family moved from Ohio to the ONE last year, is not only creative and artistic, but organized and a leader. A Shorecrest junior, she jumped right into the theatre program and serves as stage manager. Though her role is behind the scenes, she and the crew are vital to the production. If you go: The longest-running show in Broadway history, Phantom of the Opera features lavish costumes and scenery, as well as a thrilling score with well-known songs, including “Music of the Night” and “Masquerade.” Set in a 19th-century French opera house, a beautiful young soprano becomes the obsession of a disfigured musical genius who lives in a haunting underground lair. Consumed with winning her love, the Phantom terrorizes the opera house in this dramatic story that reveals the true power of music and love. 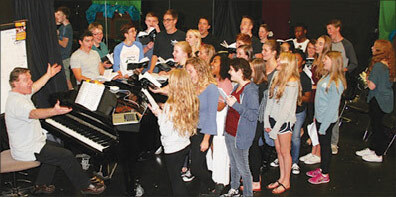 Shorecrest’s production of Phantom of the Opera runs April 14-16. Tickets are $10 for students and $20 for adults, and are available for purchase at the Box Office April 11-15 8am-4pm, and 90 minutes before each show. The Janet Root Theatre is on the Shorecrest campus at 5101 First Street NE in St. Petersburg. For more information, visit www.shorecrest.org, or call the Box Office at 727/522-2111.